Have you used all of the disposable applicators that came with your Pre~Seed, yet still have product left? 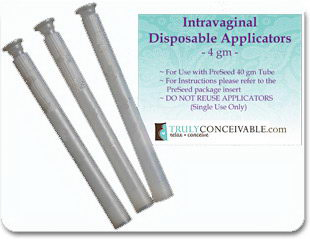 Sold in packs of 3 ~ These 4 gm Intravaginal Disposable Applicators are for use with Pre~Seed Fertily Friendly Lubricant. For instructions please refer to the Pre~Seed package insert. I run out of applicators everytime, I am so glad I can buy them here! with any order over $30! then click here to add a FREE CD to your shopping cart. To see descriptions of the Conception Series CDs, click here. Tell a friend about the great products at Truly conceivable.